I put together a little hack that shows the tweets you’re no longer getting. Each entry is shown with a link to the original Tweet on Twitter so you can click to get the full details of the tweet. It is all in one HTML file: whatumissed.html. It should be pretty easy to turn off the diagnostic data if you like by using visibility: hidden for the “statusmsg” div in the html/script. There is no little CSS or other styling here – if you hack the code with cool CSS styling, please post back to me so others can benefit too. If you make other hacks to this code, or have other suggestions for me, please let me know. I don’t understand. If they are @replies, they show up. But your image isn’t showing @replies – not sure what this program is supposed to be finding. 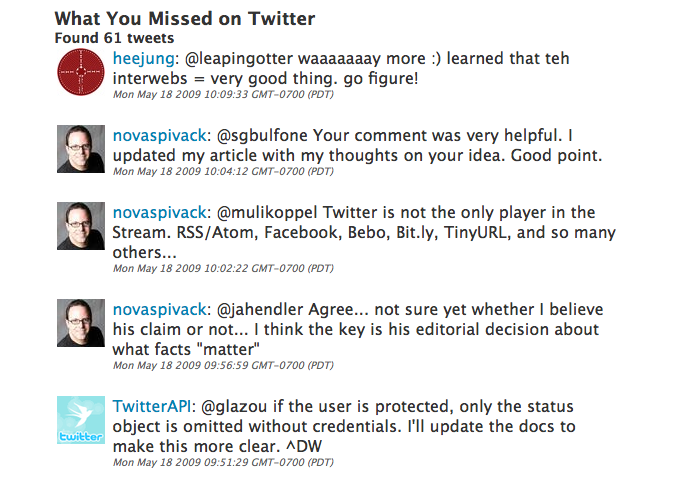 In the past, when people you follow posted a tweet, those tweets would appear in your updates at http://twitter.com/home (or API /statuses/friends_timeline). The “whatumissed” hack shows the tweets that Twitter isn’t showing you anymore. As to why it’s not working for you, let us know the browser you’re using. This is a great piece of software! Just 2 suggestions (I’ve not checked the code, so I have no idea if it is possible) 1) Grab “in reply to” link. 2) Recognize URLs and make them a link. It turns out the search API doesn’t provide “in reply to” so in order to show an “in reply to” link, it would require an additional API call per tweet, which would probably run a pretty big risk of hitting API limits – so I will leave an “in reply to” link hack as an exercise for the reader. Thanks for the reply MrBlog. I know that is not intended to replace Twitter but I’m finding myself to use it a lot! Auto-refresh with since_id should be doable. In terms of it becoming a real client, what would be really cool is as a greasemonkey script for the normal twitter.com site, but that would be a pretty large task. Perhaps a version that shows the full stream does make sense though, even in this somewhat crude form, jumping to twitter for other actions, etc. – in other words, not replacing all of Twitter.com but just an alternative “home” screen.